It’s that time of year to wrap things up and it’s been a wonderful season for the blog and the radio show. I know that both are on different series numbers as this blog is on seven and the radio show at three. It’s still confusing to say the least. As June wraps up, it was an exciting month due to various events and finally going to Toronto after a six year absence. This past weekend was exciting as there were so many events in Ottawa. The Ottawa Dragon Boat Festival, TD Ottawa Jazz Festival and one event I took part was The Community Cup. It was fun taking part in the soccer tournament, even though I was sore the next day. I will admit that I was out of shape playing soccer due to a lot of speed and endurance. Overall, it was to show new Canadians show the love of the game. I was able to document the trash talking tweets between CKCU & CBC Ottawa and the images. It is at this link. Looking back from this year, it’s been an opportunity to chat with the usual Canadian bands and musicians. Probably the most exciting was getting my co-host, Lauren to come out and help me assistant on the interviews. The highlight having to be Dan Mangan back in October. Considering that he’s become popular now since the release of Oh Fortune and winning a Juno Award. Another highlight was having Candice So coming on the show in November and having fun with the music that I usually play. There were a few low points but it won’t be mentioned. It was back in late October and early November, you’ll probably know and it was very frustrating for a reason. Who’s the band to finish off this season? It’s Wendy Versus from Toronto. The interview was aired on CKCU-FM and I made a mistake after airing the interview by saying Crayon War instead of Crayon Wars. The playlist for this week’s radio is at this link. Have a great Summer. On a programming note, I will be airing the Nat & Marie interview in three parts. The Summer edition radio show will slightly be on the social media and online culture aspect. Hope you will enjoy it. The June 27th Show – Press play to listen. I will finally be making the trek to Toronto for NXNE. It’s been mentioned several times that I have not gone to Toronto for quite some time and a slight dislike of the city. I caved in and going to the music festival, which is modeled after SXSW. Due to the previous schedule conflict from Ottawa Dragon Boat Race Festival, it’s an opportunity this year to check what the Toronto music scene offers. I am also hopeful I can meet the social media/Internet celebs in the form of Nat & Marie. Since they gave me a slight influence to what I do on Twitter and Facebook. Aside from that, this week’s radio show consisted of bands and musicians attending NXNE and another festival not linked to NXNE. Also played were would be contenders for the 2012 Polaris Music Prize Long List. The Wild 10 Countdown had two new entries, they were Loon Choir and Young Galaxy. At number one for the second week, it’s still Cold Specks. The live show had Erica joining again and played a bunch of bands who will be at NXNE and Luminato. Due to some technical difficulties, the live part of the radio show is repaired as there were issues with the quality. Lastly, don’t forget to check updates on Twitter and Instagram for my activities at NXNE. The playlist for the June 13th radio show is over at this link. The June 13th Radio Show – Press play to listen. I finally made it to Toronto on Friday and it was definitely a great time as I went to CBC Toronto Broadcast Centre for a tour along with CBC Radio 3 fans. It was a surprise to see Jian Gomeshi from Q (If you have me on Instagram, you will know why). I had a chance to interview Grant Lawrence to be aired on Wednesday’s show. Then later on, I had a chance to interview Papermaps and Wendy Versus. Last, but not least, I got to meet Marie from Nat & Marie as we went for sushi. Unfortunately, Nat wasn’t able to meet up. 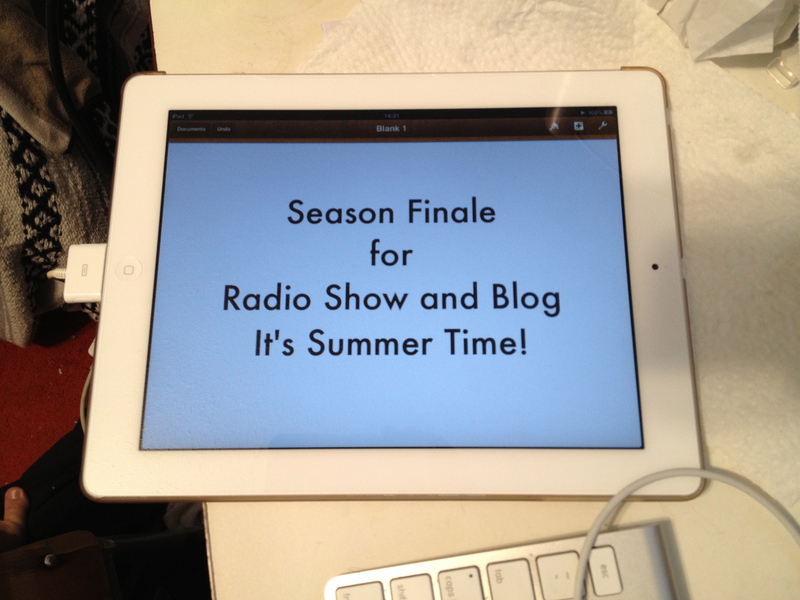 It’s June and it’s the time when I start to wrap things up to the current season on the blog and the radio show. It was quite a surprise to begin June’s show with a return appearance of a previous radio host at CKCU. It was Erica, formerly of Horses Spilled Milk and was an occasional guest on my radio show. It was great to play Feist and Beach House with her accompaniment as there’s been excellent indie music releases lately. The reason to playing Feist was that she will be performing at Parliament Hill for Canada Day on July 1st. Aside from that, there was a dedication to the graduating students at Carleton University as the convocation were happening this week. As mentioned on the radio show, I had the opportunity to meet some of the people on other CKCU-FM shows since it was connected to their Journalism program/courses. It’s become a yearly thing to play Graduation (Friends Forever) by Vitamin C as it’s played at this time when the school year ends and people moving on. As usual, the blog part of the show has the Wild 10 Countdown. There’s a new number one song to start June and then there are two performers who will playing at Ottawa Folk Festival. Lastly, Westfest is this weekend as there’s so many events happening for the month of June and onwards until September in Ottawa. It will be endless to check out festivals throughout Summer. To check what was played, the playlist to the June 6 show is at this link. The June 6, 2012 Radio Show – Press play to listen.